There are no other portable desalinators that can be operated in 12/24 V DC power and manually. In addition, the Katadyn PowerSurvivor 40E is the most affordable in its class and will output 1.5 gallons per hour. This unit can be installed permanently, or outfitted in a case and taken anywhere you have a good source of sea water. In my opinion, the Katadyn PowerSurvivor 40E is the best of all the Katadyn desalinators and the best value. It offers flexibility and performance no other brand or desalinator can match. Overall a great buy! Why The Katadyn PowerSurvivor 40E Desalinator? Recently, I was talking to friend in Vancouver BC about Hurricane Sandy (who isn’t these days), and one of main things we focused on was the lack of fresh water available amidst all the flooding – and considering it is mostly sea water, you can’t drink it! My friend, a bit of a prepper himself, and the owner of a yacht, was quick to point out the lack of portable desalination plants and water filters the Government & Fema could be using in these situations. As a yacht owner, and a safety fanatic (a good thing for boat owners) he brought up how easy it is to desalinate water with fairly simple equipment, in his case, a Katadyn PowerSurvivor 80E. He also keeps a Katadyn 06 Manual Desalinator in his life raft emergency kit (I’ll post a review about that one in the near future). Our conversation quickly turned from Hurricane Sandy to the different products available to desalinate water, and how much difference it would make around the world if people had access to products like those made by Katadyn. Needless to say, the next few hours were spent with me asking him a barrage of questions about the Katadyn unit on-board his yacht. Afterwards, I really wanted to research this method of making pure water, and this review is the result of that conversation and the followup research I did. The first thing I found out, when it comes to small and affordable portable desalinators, there is only a small number of leading manufacturers, Katadyn, Spectra Watermakers and Ampac. Katadyn and Spectra offer several products, and Ampac just one portable model, but Spectra and Ampac are priced much higher than Katadyn (about 50% more) and there products are much larger than Katadyn, so I decided to focus on the Katadyn desalinators. Katadyn desalinators can easily be purchased online, they are fairly simple to install, and reasonably affordable. They offer 5 models which includes the one that I feel is extremely versatile, the Katadyn PowerSurvivor 40E. The Katadyn PowerSurvivor 40e is a 12/24 Volt DC electrically powered unit with the option to operate it manually should your power source fail (the only desalinator I know of that can do this). The other 5 models have their merits, but the are either manually operated or electronically operated. I will go over these ones very briefly before I dig into the PowerSurvivor 40E. With the brief details above, you now have a enough information to compare them with the Katadyn PowerSurvivor 40E. This is important, especially when considering a portable desalinator. The Katadyn 06 and Survivor 35 or both manually operated and require a lot of work to produce a small amount of water, but they do not require power and are portable. The other two models, the PowerSurvivor 80E and 160E are 2 piece units, they are larger, heavier and both require power with no way to operate them manually – this does not make them a good option for a portable desalinator. Personally, when it comes to filtering fresh water (not sea water), I think Reverse Osmosis is a huge waste of water. However, for salt water, it is the perfect solution. In large scale operations, I would think the waste water brine could be stored in large reservoirs and allow nature to evaporate the water leaving the sea salt which may have other uses (not sure). 12-Volt Powered or Manual Backup Override – easy to change over! As you can see, the unit is neither heavy or large, and it is a one piece unit which makes it easier to transport if required. Power consumption is low enough to make solar power a practical source but you could also rig this unit up to run from a vehicle. To date, most installation have been on yachts, but that is only because few people have considered using the ocean as a source for fresh water (land dwellers that is) – primarily due to the high cost of these units in the past. The other reason is technology, affordable and reliable desalinators in a portable size have not been available until the last decade, especially in the sizes and price range offered by Katadyn. Two things make the 40E ideal for portable desalination. First is the size and second is the power draw. Although I am not an electrical expert, it is easy to see that the PowerSurvivor 40E can easily be run from a variety of vehicles including ATV’s, Cars and Trucks as well as a small generator. It can even be run directly from a battery previously charged via solar power or other charging source, however, the length of time the unit will run will depend on the battery size, age, quality and environmental factors. The size and weight (25 lbs) of the PowerSurvivor 40E is relatively small, 16.5 inches x 15.5 inches and 7″ deep. 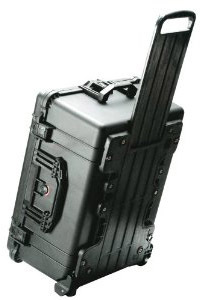 You could easily outfit this unit in a Pelican 1610 Case (strong, airtight case used by the military and other organizations) with all parts, hoses and maintenance supplies inclusive. This in turn can be mounted on an ATV, stored the back of an SUV/Pickup, or in the trunk of a car. Regardless of what type of case you purchase, make sure it has room for all these supplies, including the pre-filter assembly. I won’t get into the electronics and hookup requirements here as I am not qualified to do so. You can view the PowerSurvivor 40E manuals I have provided further down the page to figure out what will work for the application you intend to use, and where. Whether it is a Katadyn desalinator or any other brand, you have to be careful with the quality of sea water entering the unit. 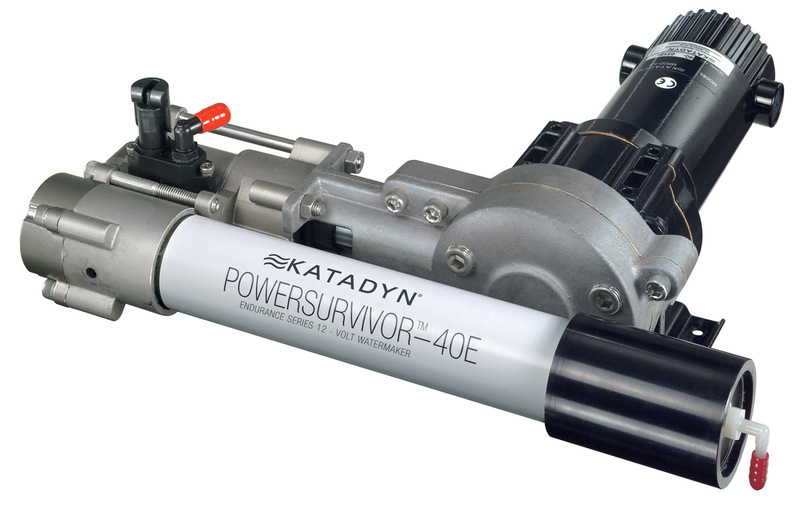 The Katadyn PowerSurvivor 40E comes with a 30 micron pre-filter assembly to remove silt and other contaminants from entering the unit. 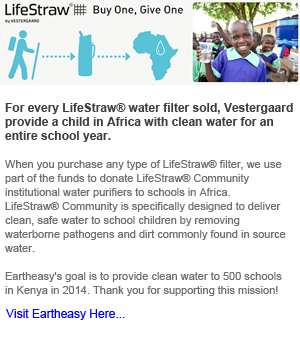 For really poor quality sea water, Katadyn Recommends using their 5 micron pre-filter assembly. Using a pre-filter is a must to ensure years of trouble-free use with any of the Katadyn desalinators. If oil, gasoline or diesel gets into the semipermeable membrane it will destroy it and a new one will run you about $400 plus depending on the model you purchase. Katadyn systems are configured to recover and effectively re-use the energy wasted in conventional reverse osmosis. The waste brine stream contains up to 90% of the energy expended. By recovering this energy, Katadyn PowerSurvivor desalinators use less energy making them one of the best choices for portable and remote desalinators. The PowerSurvivor 40E watermaker utilizes a low-volume, high-pressure, positive displacement pump. Unlike the centrifugal pumps found in some systems, a positive displacement pump is self-priming. It can also draw water when located several feet above the waterline. Thus, the PowerSurvivor 40E can be operated in almost any location and orientation – you do not have to be right at the water line or sea level for the unit to function properly. In addition to desalination, the Reverse Osmosis process removes bacteria, parasites, viruses and other dangerous contaminants – See manuals below for additional specs. Provided you are careful to make sure your system does not take on any particles that will damage the membrane and you follow storage instructions carefully, the PowerSurvivor 40E should function trouble free for many years. That said, there are a few key points to consider. Always use the pre-filter assembly, no matter how clean the water looks. If the unit is not used on regular basis, and you do not plan to use it for sometime, you “MUST” use the Katadyne Membrane preservative and follow instructions accurately- see manuals below for more information on this. Parts are not easy to find anywhere but on the Katadyn website. Lots of vendors sell the main units, few carry parts – This is says a lot in respect to the quality of Katadyn systems – no one carries parts because they are seldom needed and it is not worthwhile for these 3rd party vendors to carry stock. Visit Katadyn Parts directly if you need anything in the future – Note: do not buy the main unit at Katadyn, they are much more expensive than elsewhere. Overall, as long as you are careful choosing a clean source of water and make sure you use the pre-filter system, maintenance of a Katadyn desalinator is minimal compared to other brands. I encourage you to read the manuals below and you will see what I am talking about. If you will be using the katadyn PowerSurvivor 40E or the 80E, 160E in a remote location, it would be wise to consider buying their extended mainatenance kit. 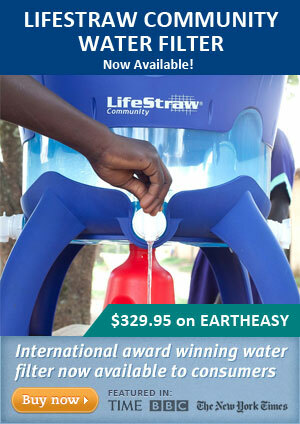 It is not cheap, about $720, but if you are away from civilization you want to be sure you have everything with you to ensure you can always produce clean safe drinking water. These kits are only available on the Katadyn website under parts and accessories. I always think it is a good idea (if possible) to read the owners manual for products before I buy them, especially if the price warrants careful consideration. Below are links to the 2 manuals available for the PowerSurvivor 40E. The Katadyn Survivor 35 is a manually powered desalinator that will produce 1.2 gallons of fresh water at 30 strokers per minute or 1800 strokes an hour. At a price tag of $2195 I think it would be practical to consider the PowerSurvivor 40E instead. The manpower involved to produce 1.2 gallons of water is substantial with the Survivor 35 and should be taken seriously, especially if you plan to use the Survivor 35 as a primary source to produce water and not just a emergency source of water. The PowerSurvivor 40E on the other hand, produces 1.5 gallons an hour using 12v or 24V power, but it can easily be used manually when no power is available at 30 pumps per minute and 1.2 gallons per hour. This makes it a very productive unit when power is available and can still be used without power. It sells for $3695.00 which is $1500 more than the Survivor 35. Considering either unit will last at least several years (likely much longer), you really need to access the cost difference between the two units. If used as a primary source of water, is it worth the extra $1500 to buy the PowerSurvivor 40E over the Survivor 35? I would say so, 1800 strokes an hour manually is a lot of work for 1.2 gallons of water, it would not be practical to pump water for 2 or 3 hours just to meet daily needs – even in a camp or yacht scenario. With the PowerSurvivor 40E, you can take this with you anywhere and use it without all the work. At first, the extra cost might bite, but in the long term, the extra $1500 for the PowerSurvivor 40E will seem trivial. The only reason to purchase the Suvivor 35 over the PowerSurvivor 40E is if the unit will only be used for an emergency, in this case the Survivor 35 makes sense. Otherwise, I would buy the PowerSurvivor 40E. The PowerSurvivor 40E represents the latest advancements in watermaker technology, featuring an improved oil-bath drive assembly, an all-316 stainless steel pump body, and simplified construction for easier and less frequent maintenance. It uses very little energy as Katadyn systems are configured to recover and effectively re-use the energy wasted in conventional reverse osmosis. It is the only desalinator that can be operated by 12v or 24 volt power and by hand should you ever have a problem with the power source – that on its own could be a lifesaver. The PowerSurvivor 40E (and the 80E / 160E) come with a 3 year warranty that covers “ALL” parts – a testament to Katadyn quality and confidence in their products. For the price and flexibility, you will not find a better desalinator that can be used anywhere in the world. It is lightweight and compact making it ideal as a portable unit – in my opinion, it is the best desalinator for the money! First and foremost “NOT” Katadyn! Why? They are the most expensive place to buy and you will pay about 10% more if you buy directly from them. Dealers are your best option and you still get the 3 year warranty (which is back by Katadyn directly so it does not matter where you purchase the unit – as long as it is new). I purchase a lot of technical items from Amazon, their shipping is reasonable and fast (Tip: use regular shipping as it seldom take much longer). Katadyn products average about 10% lower on Amazon than anywhere else, however, keep in mind that Amazon is a front end for other 3rd party vendors so you may not be familiar with the company that actually ships the product – or their customer service. This is important should there be a problem with your order. Amazon customer service is marginal at best so take this into consideration before you purchase through them.